As every small business owner knows, monthly expenses for software, tools, and subscriptions needed to run your business can add up quickly. If you’re tired of spending too much for a landline you don’t use, paying for an extra device on your carrier plan (i.e. 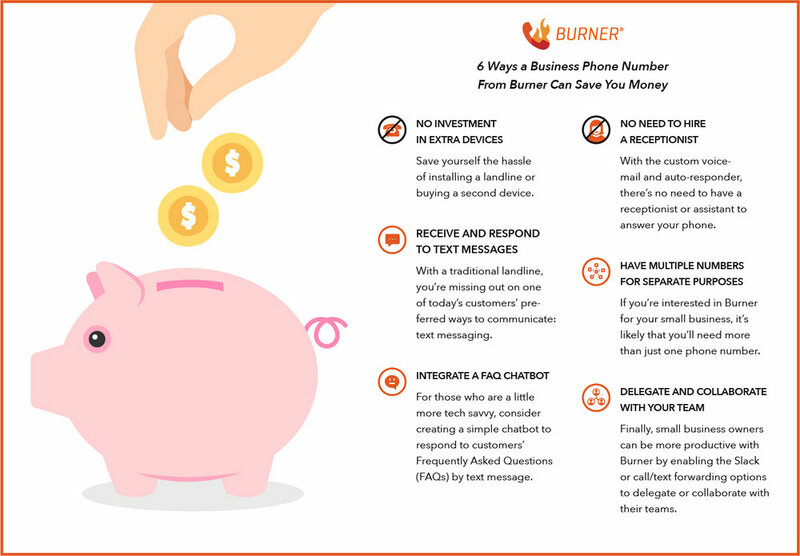 AT&T, T-Mobile, Verizon), or if you’re just plain sick of the limitations imposed by Google Voice and other free phone number apps, Burner provides an affordable option for creating professional business phone numbers dedicated to work. Instead of an extra $40 per month for a second line from T-Mobile, download the Burner app and get a fully-functional business phone number for a fraction of the cost. Share this infographic with your friends to help them save money on business phone numbers, too! Click here to share on Twitter or click here to share on Facebook. Save yourself the hassle of installing a landline or buying a second device. Traditional landline phones are disappearing from the workplaces of today, unless you’re running a large brick-and-mortar store or customer service center where you need dozens of phone lines. Are you a freelancer? Is your business online? Do you work for someone else and simply don’t want to mix up personal and work-related calls or texts? If you answered yes to any of those questions, you’re a good candidate for a subscription Burner. With a second phone number from Burner, you can choose your area code, set up a personalized voicemail or text auto-responder, and utilize Do Not Disturb mode for when you’re unavailable. With the custom voicemail and auto-responder, there’s no need to have a receptionist or assistant to answer your phone. Take calls when you’re available and the rest of the time, turn on Do Not Disturb mode and get back to callers at your convenience. The voicemail and text auto-responder with Burner is ready to be personalized. You might choose to include your hours of operation, business address, event details, or alternate ways to contact you. You can update and change your voicemail and auto-responder at any time, making it infinitely customizable. With a traditional landline, you’re missing out on one of today’s customers’ preferred ways to communicate: text messaging (SMS and MMS, which includes emojis, photos and animated GIFs). With Burner, you can receive and respond to your customers’ text messages from an app on your smartphone or even via Slack. For some customers and small business owners, this is simply a convenience. Who wants to spend time on a phone call when you can send a quick text message instead? On the other hand, it also opens up communication lines for customers who may prefer texting to calling. If you’re interested in Burner for your small business, it’s likely that you’ll need more than just one phone number. Maybe you have multiple departments or employees who need to have their own numbers. No problem! With Burner, you can have multiple phone numbers for your business. Each device that downloads the free Burner app can have up to three unlimited subscription lines for just $14.99 per line per month. Each device can also manage up to 200 non-subscription lines paid with credits. If your employees need dedicated work numbers, encourage them to download Burner and create a work phone number with the same area code your customers use. Reimbursing an employee five bucks a month and giving them the work/life separation of a dedicated line will make them more productive, professional, and autonomous. For those who are a little more tech savvy, consider creating a simple chatbot to respond to customers’ Frequently Asked Questions (FAQs) by text message. This chatbot can be created with the Evernote Connection on Burner. Advanced users who don’t mind a little coding can check out FAQbot for a slightly more nuanced set of auto-responder options. When a customer texts your phone number and asks for the company’s address, your chatbot can automatically respond on your behalf with a preprogrammed message. How great is that? For Airbnb hosts, we even created a specialized chatbot to answer guest questions, called Hostbot. Connect your Burner number to Hostbot and it will automatically respond to your guests’ questions, freeing up your time for other tasks. Finally, small business owners can be more productive with Burner by enabling the Slack or call/text forwarding options to delegate or collaborate with their teams. Delegation is simple and works like the call and text forwarding functions that you’re used to. Simply set up forwarding in the settings of your Burner, and enter the number where you want your messages/calls to be temporarily forwarded. As for collaboration, link your Burner phone number with the Slack Connection to allow your team to read and respond to text messages without leaving Slack or even needing to install Burner on their phones. A second phone number with Burner costs just $4.99 a month. Create your number to get started today.